According to the African Union’s Committee of Experts on the Rights and Welfare of the Child the focus of the Day of the African Child 2016 will be on ‘Conflict and Crisis in Africa: Protecting all children‘s rights’ . Halley Movement & PAN-Mauritius Coalition will be holding an Advocacy Forum at the Excellence House where child focused practitioners will facilitate discussions with violence survivor children, and other children to give them an opportunity to share their views and solutions of eliminating conflicts and crisis and how best their rights could be protected by States. 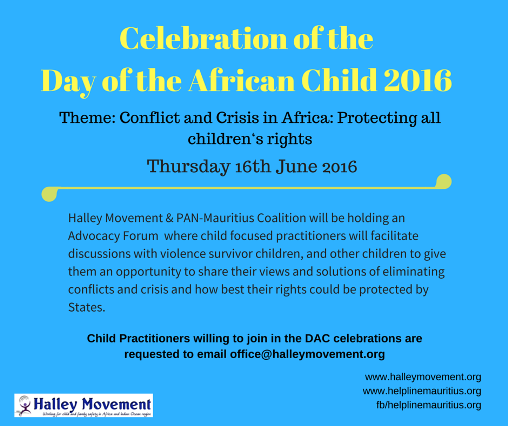 The DAC Advocacy Forum will be celebrated on Thursday 16th June by Halley Movement.